“The finance ministers and executives of the BRICS central banks are negotiating ... setting up payment systems and moving on to settlements in national currencies. SWIFT or not, in any case we’re talking about ... a transnational multilateral payment system that would provide greater independence, would create a definite guarantee for[BRICS – ed. ]countries on risks associated with arbitrary decisions …made by countries that have current payment systems under their jurisdiction,”Russian Deputy Foreign Minister Sergey RyabkovtoldRIA in an interview published Wednesday. Ryabkov’s interview comes prior to the July BRICS summit in the Russian city of Ufa. The summit will see the launch of projects expected to solidify the group’s ever growing role on the world political stage. 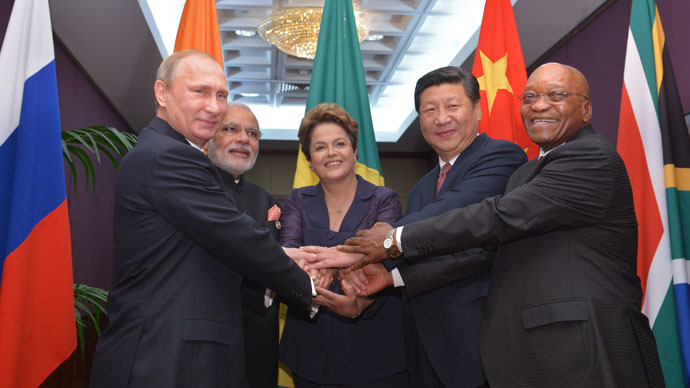 Among them are the $100 billion BRICS New Development Bank (NDB), targeted to compliment the World Bank and bankroll the group’s infrastructure projects, and a currency pool worth another $100 billion, expected to protect BRICS from exchange rate volatility. Russia has recentlyjoinedChina’s Asian Infrastructure Investment Bank (AIIB), aimed at funding infrastructure projects in the Asia-Pacific region that is not expected to compete with the NDB, but complement it, said Ryabkov. “The United States and, perhaps, the European Union cannot but feel jealous about such initiatives. They see them as a reflection of the processes leading to an objective reduction of the weight of the founding fathers of the Bretton Woods system in the global financial and economic architecture,” said Ryabkov, adding that the criticism will only intensify when the bank is officially launched.